Robin Hood was the legendary hero of England who stole from the rich to help the poor. The stories about Robin appealed to common folk because he stood up against—and frequently outwitted—people in power. Furthermore, his life in the forest—hunting and feasting with his fellow outlaws, coming to the assistance of those in need—seemed like a great and noble adventure. Early Sources The earliest known mention of Robin Hood is in William Langland's 1377 work called*Piers Plowman,*in which a character mentions that he knows "rimes of Robin Hood." This and other references from the late 1300s suggest that Robin Hood was well established as a popular legend by that time. One source of that legend may lie in the old French custom of celebrating May Day. A character called Robin des Bois, or Robin of the Woods, was associated with this spring festival and may have been transplanted to England—with a slight name change. May Day celebrations in England in the 1400s featured a festival "king" called Robin Hood. Later Versions By the 1500s, more elaborate versions of the legend had begun to appear. Some of these suggested that Robin was a nobleman who had fallen into disgrace and had taken to the woods to live with other outlaws. Robin also acquired a girlfriend named Maid Marian and a new companion, a monk called FriarTuck. His adventures were then definitely linked to Sherwood Forest. Beginning in the 1700s, various scholars attempted to link Robin Hood with a real-life figure—either a nobleman or an outlaw. But none of their theories have stood up to close examination. Robin was most likely an imaginary creation, although some of the tales may have been associated with a real outlaw. Also at about this time, Robin began to be linked with the reigns of King Richard I, "The Lionhearted," who died in 1189, and of King John, who died in 1216. The original medieval ballads, however, contain no references to these kings or to a particular time in which Robin was supposed to have lived. Later versions of the Robin Hood legend placed more emphasis on Robin's nobility and on his romance with Marian than on the cruelty and social tension that appear in the early ballads. 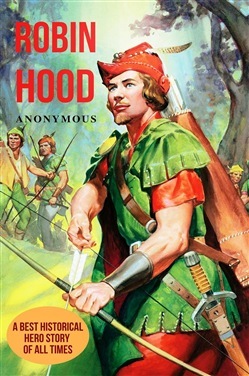 In addition to inspiring many books and poems over the centuries, Robin Hood became the subject of several operas and, in modern times, numerous movies. Acquista Robin Hood in Epub: dopo aver letto l’ebook Robin Hood di Anonymous ti invitiamo a lasciarci una Recensione qui sotto: sarà utile agli utenti che non abbiano ancora letto questo libro e che vogliano avere delle opinioni altrui. L’opinione su di un libro è molto soggettiva e per questo leggere eventuali recensioni negative non ci dovrà frenare dall’acquisto, anzi dovrà spingerci ad acquistare il libro in fretta per poter dire la nostra ed eventualmente smentire quanto commentato da altri, contribuendo ad arricchire più possibile i commenti e dare sempre più spunti di confronto al pubblico online.